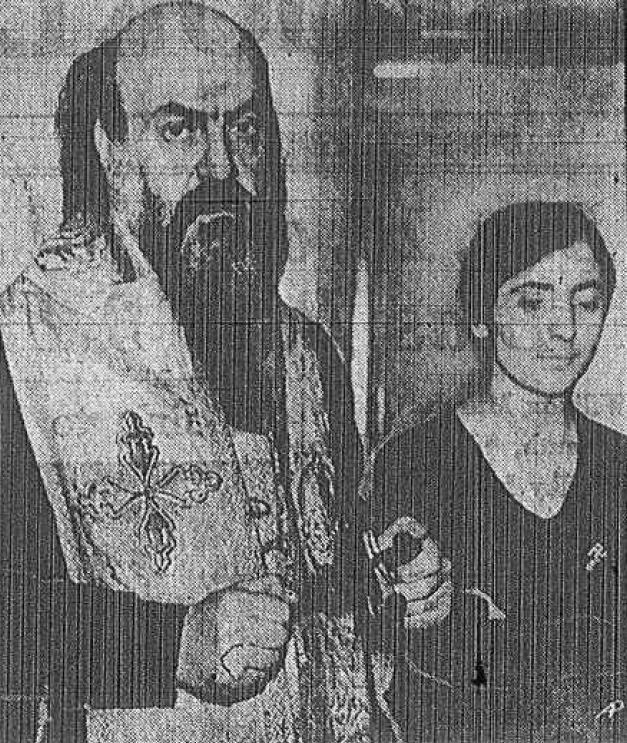 Archbishop Aftimos Ofiesh and his young wife, Mariam, shortly after their wedding on April 29, 1933. Photo from the Brooklyn Daily Eagle (5/8/1933). 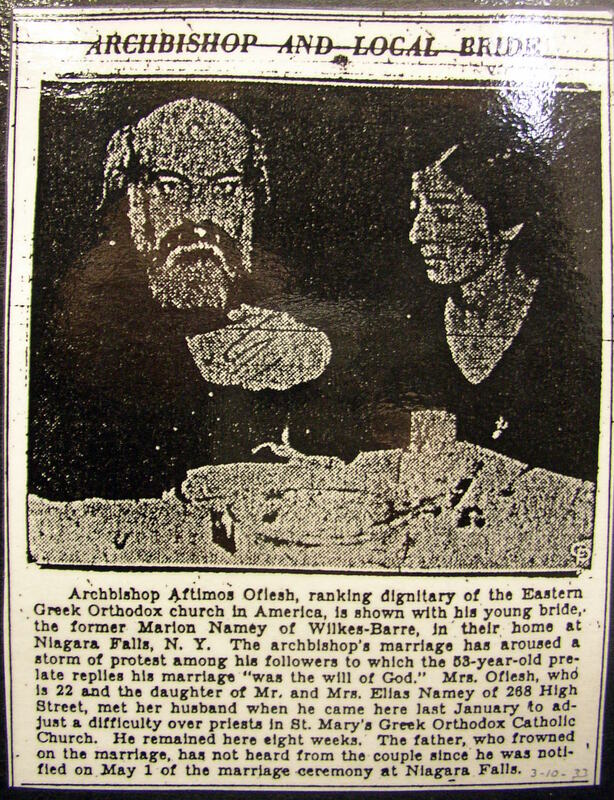 In the half-dozen years before his wedding on April 29, 1933, Archbishop Aftimios Ofiesh had moved further and further away from mainstream Orthodoxy, setting himself up as the head of an “autocephalous” jurisdiction called the American Orthodox Catholic Church—which at its inception in 1927 had the official blessing of the Russian Metropolia in America (which would in 1970 become the OCA). His wedding to the former Mariam Namey (no relation to our own Matthew Namee) essentially represented his final break with any official Orthodox ecclesiastical authorities. Aftimios continued to call himself an archbishop, and he even made occasional visits to Orthodox parishes, but his hierarchical career was effectively over the moment he tied the knot. He also became a pariah in the Syrian community in and around Wilkes-Barre, Pennsylvania, where Mariam was from and where the couple lived (among other places) for years after their wedding. 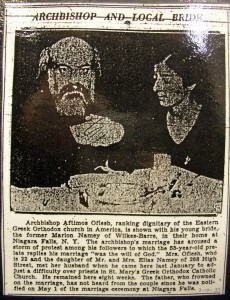 Before he met Mariam, there were indications that Aftimios had planned to marry, essentially to try to make a point about his opinions on episcopal celibacy—that it was a “man-made” institution that could be abrogated at any time, especially now that he was in the New World. Even though his own synod in the American Orthodox Catholic Church officially agreed with him, they also declared him “retired” in the same message with which they congratulated him on his nuptials. Despite the ideological premeditation of his marriage, when Mariam later recounted their meeting in her biography of her late husband, she described it in endearing, romantic terms. Their marriage lasted until his death thirty-three years later, producing a son named Paul within a couple of years after the wedding. Aftimios never served as a bishop of the Orthodox Church ever again, although he dressed as one, and members of the Namey family remembered him as Amo Sayidna (“Uncle Master”; sayidna is the Arabic equivalent of the Greek despota or Russian vladyka). His break with Church authorities was so bitter that in his will he stipulated that his funeral and burial were to involve no clergy of any kind. He died in 1966.